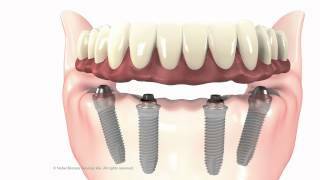 Implants are titanium screw-like structures that are used to replace one or all of your teeth. Not only do implants restore a person’s smile with a natural and life-like restoration, but also they are able to re-establish a person’s chewing ability. Consequently, implants provide security, comfort and confidence by providing a permanent solution for missing teeth. Implants are placed in areas of existing bone and become integrated within the bone. They can be used to support a single tooth, multiple teeth or even a completely missing dentition, depending on the position and the number of implants placed within the jawbone. In the case of a missing single tooth, an individual crown is fabricated over the implant. 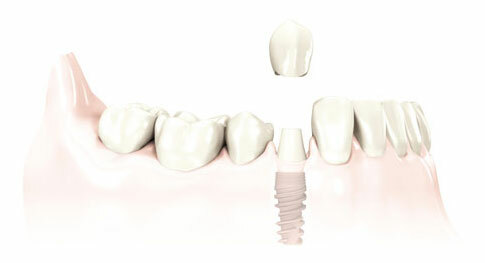 Implants offer benefits over traditional bridges. With implants, there is no need to grind down healthy adjacent teeth. The implant acts as a root to help prevent bone deterioration whereas traditional bridges will eventually lead to bone loss under the unsupported tooth. This can result in an unattractive dark space at the gum line. When multiple teeth are missing, several implants can be used to support a bridge or a complete denture. Implant-supported dentures offer a significant advantage over conventional dentures, because they stay securely in place and help to prevent bone loss. There is no slipping or shifting, you can bite and chew naturally, your taste ability may also improve and your speech is not as greatly affected as with regular dentures.